This is 27-year-old Justin Hardiman from Mississippi. 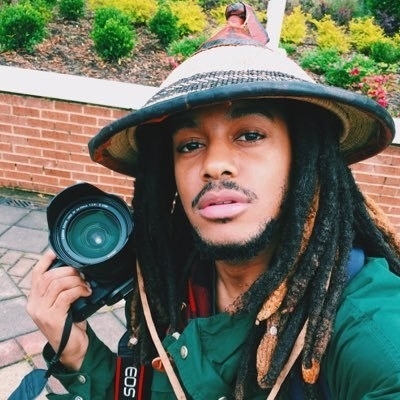 He’s working on becoming a full-time professional photographer, but in the meantime he freelances and leads a photo-editing class. In a recent shoot, he and a small team of people drove around Vicksburg, Mississippi, all day trying to find the best location to shoot, but they were coming up short — and the sun was quickly coming down. “I was looking for white buildings and columns, but we couldn't find anything,” Hardiman explained. He was also traveling with a model, hair stylist, and a make-up artist. “Originally we were supposed to shoot at this Civil War museum, but it was closed,” by the time they arrived around 6 p.m.
Then, Hardiman came across a field in the small town that had vines covering its hills. He asked the model to stand among them, as he started to climb an old, abandoned building nearby to get on its roof. Hardiman said there was a large ditch he had to jump over, and he cut his hands and legs in scaling the building.